Cruising down the open road with the top down, the wind in your hair, summer classics on the playlist? When it comes to buying a convertible car, it’s not always about practicality. Sure, style is important but there are a few other things you need to consider when buying a convertible. Convertibles come with either a hard top or a soft one. There are pros and cons to both so weigh them up carefully first. Generally, soft top convertible cars with a manual fabric roof are cheaper to buy and own. They weigh less compared to hard top models, which can have a slight impact on fuel costs. They’re less likely to have mechanical problems and if you should encounter this type of problem, it’s cheaper to fix. A convertible with a fabric roof may be less secure than a hard top, making them an easier target for thieves and vandals. Because fabric doesn’t provide as much insulation, depending on their construction soft tops may not be as warm – and can be more noisy to drive, especially with the roof down. Hard tops look sleeker when the roof is up and you don’t have the road and wind noise issues. There’s also less of a security concern with a hard top, which can be important if you don’t park in a garage. Cost is the main downside, from the initial price to repairs, as the sensors and computer technology aren’t cheap to fix if they break. Boot space is reduced to make room for the roof to go and the extra weight means acceleration may not be as nippy. Hard top convertible cars are always automatic and power operated, but soft top models sometimes offer a choice. Most new soft top convertibles are automatic with just a touch of a button, yet some older ones are still manual. These require latching and unlatching the roof to get it up or down. It differs from car to car, but you should definitely practice when viewing the vehicle, as some can be a lot trickier and require extra strength. You don’t want to buy a convertible car that’s too tricky to operate. Aside from theft you may have other safety concerns about driving a convertible. When the roof is down there are fears of what could happen in a rollover. As technology has improved, so has convertible safety. Most include a pop-up or fixed roll bar, though it’s best to check this before buying. Pop-up roll bars are deployed when the car senses that a rollover is occurring, while fixed ones are behind the headrests and visible. Others include side airbags designed to extend out, but you should always read the reviews and check the safety rating and features on your chosen car first. Convertible cars come in a range of different shapes and sizes, so you can pick one that best meets your needs. If you’re after a family car, then a sensible mid-sized model such as a Vauxhall Cascada could be a good choice. 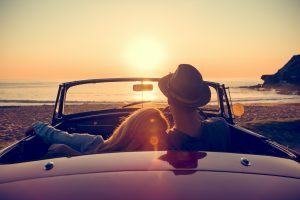 If you only need something for you and your partner then one of the many convertible roadsters, from an Audi TT to the incredibly popular Mazda MX-5, may be best. Electric and hybrid, 4X4, four-door, luxury models and more can be found when looking for a convertible car to suit your style and practical requirements. As with buying any car, there are a few things to think about before you take the plunge. Do you want to buy brand new or used? Will you purchase outright or on finance? What fuel type, engine size, driving technology, entertainment features, and connectivity do you want? Drawing up a checklist will help you make the right choice.